PARIS, Dec. 13, 2006—The sale of the Lebel Collection of American Indian masks by Calmels-Cohen at the Hotel Drouot in Paris on Dec. 4 was a major event for collectors in the field—and the interest was reflected in the high prices paid for the best examples. Collector Robert Lebel, the writer and biographer of Marcel Duchamp, was a friend of surrealist poet André Breton, and both men shared a passion for Eskimo art, which they collected during their exile in America in the 1940s. They bought mainly at the New York gallery of Julius Carlebach, which Max Ernst discovered when he stopped in to try to buy a Haida spoon. When Lebel, Breton and other surrealists were collecting this type of art in the ’40s, it was virtually unknown to the market. They introduced it to Paris when they returned after World War II. The collection auctioned off last week included six Pueblo masks from Arizona and New Mexico, as well as one Kwakiutl mask from British Columbia and nine Yup'ik Eskimo masks. Yu'pik masks from southern Alaska are made for propitiatory festivals associated with hunting and fishing and include depictions of a wide variety of beings, both natural and supernatural. Those were the stars of the sale. Seven of the nine Yu'pik masks were bought by Canadian dealer Donald Ellis, who said that there will never be another sale like this one. The remaining two were preempted by the French government for the recently opened Musée du Quai Branly. It took a mask in the image of a diving bird for €363,388 (est: €120-150,000), and a wood mask representing a half-walrus/half-caribou for €599,266 (est: €120-150,000). Among the masks that Ellis bought—both for clients and his own inventory—was a wooden mask representing a stylized human face, for which he paid €540,298, more than five times the high estimate of €100,000; and a mask in the shape of a bird's head, for €269,036 (est :€80,000-100,000). In addition to their startling beauty, the Lebel masks have an illustrious provenance. Many of the pieces are well known, having been widely published and displayed in famous exhibitions at the Musée Guimet and Centre Pompidou in Paris, and at the Museum of Modern Art in New York. 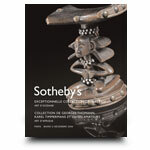 The dispersal of Lebel's collection marks the end of sales from the period when tribal arts entered France. 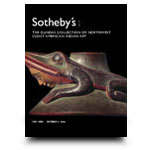 *Free registration with Sotheby's is required to view the results for individual lots. 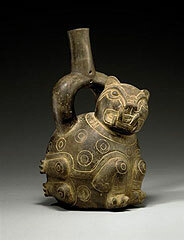 About the collection : Pottery richly decorated with symbolic designs, finely worked jades and an array of Pre-Classic and Mayan figurines from the Buisman collection provide an expression of the complex civilizations that spanned three millennia from modern-day Peru to northern Mexico. The collection is sold primarily to support the family's heritage conservation efforts, the Maecenas World Patrimony Foundation and Museum Geelvinck Hinlopen Huis. The Museum of Northern British Columbia succeeded in buying a carved spoon for $25,600 at auction Thursday, but there is more sadness about the famous 19th century Northwest Indian collection being dispersed than joy over this acquisition. "It was one of about 30 pieces we would have liked, but prices were astronomical. It's very beautiful," said Susan Marsden, director of the museum in Prince Rupert. The Sotheby's auction in New York netted $7 million (U.S.) on 57 lots, a record for native artifacts. 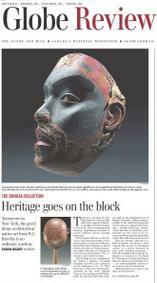 The highlight of the sale was a record $1.8 million (U.S.) paid for a multi-coloured Tsimshian mask. The lion's share of the items is coming home to Canada. Art dealer Don Ellis bought four pieces for the Museum of Civilization in Ottawa, four for his own gallery in Dundas, Ont. — to be offered to Canadian institutions at cost — and 19 pieces (including the mask) on behalf of two Canadian philanthropists. One is David Thomson, son of the late Ken Thomson, whose collections have gone to the Art Gallery of Ontario. The Tsimshian and Tlingit artifacts, known as the Dundas collection, included chief's regalia, rattles, boxes, a bone "slave killer" club, wooden bowls, masks as well as combs and spoons. 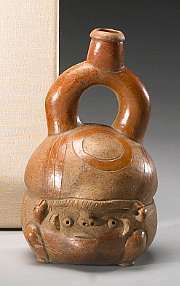 The objects had been consigned to Sotheby's by Simon Carey, a retired British psychologist whose great-grandfather, the Rev. Robert James Dundas, had acquired almost all the objects on Oct. 26, 1863, from the missionary William Duncan. The collection, the last 19th century field collection of Northwest Coast art in private hands, had tantalized Canadian museums for decades but attempts to buy it in its entirely foundered because of the many strings attached. Besides asking for a lot of money, Carey wanted it kept together on permanent display. He also demanded the publication of his great-grandfather's 250,000-word journal. While many in the cultural community celebrated the fact most of the artifacts were staying in Canada, a high-ranking Tsimshian chief expressed disappointment at the sale itself. "The missionaries got them (the artifacts) for nothing and now they put such a big price on it," James Bryant said by telephone yesterday. The Tsimshian and Tlingit descendants of the makers of the objects in the Dundas collection live in the area around Prince Rupert. But Gerald McMaster, a member of the Siksika Nation of the Plains Cree and a curator at the AGO, is gratified to see prices of native art catching up with European art. "Maybe we'll no longer ask the question, `Is it art?'" he said. The rise in valuations reflects that "we are more aware of our heritage. There is greater interest and more scholarship now." Tomorrow morning [Oct. 5] in New York, Sotheby's auction halls will be the stage for a historic struggle, the final chapter in one of the more fascinating and tortuous negotiations between a private collector and his courting museums. 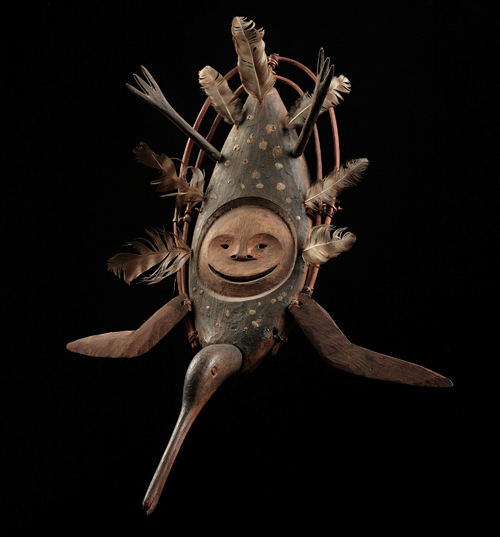 The Dundas Collection of Northwest Coast American Indian Art is up for grabs, a cache that Sotheby's head of American Indian art, David Roche, describes as "the last important field collection of Northwest Coast art in private hands." The academics can't refute his claim. The 80 objects were acquired by Rev. Robert J. Dundas, a Scottish chaplain, and they were obtained on the morning of Oct. 26, 1863, from one of the most famous missionaries on the coast: William Duncan. The setting was Old Metlakatla, near present-day Prince Rupert, high on the mainland coast of British Columbia. Adding immeasurably to the collection's appeal is the fact that it is supported by Dundas's 250,000-word-long diaries, which describe in detail the communities on the coast as he encountered them and the particulars of how this collection was amassed. Thus, the Dundas collection is a kind of historic document, a time capsule that reveals an aboriginal culture at a precise moment in time, and Canadian museums -- from the Canadian Museum of Civilization in Gatineau to the Royal BC Museum in Victoria and Prince Rupert's Museum of Northern B.C. -- are understandably anxious to see some or all of it come home. La Gazette de l'Hôtel Drouot reports (in French) on the record-breaking Vérité sale held June 17-18, 2006, in Paris. 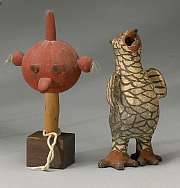 L: Auction sale catalogue; C: Statuette Punu Loumbo; R: Masque Grebo Krou. 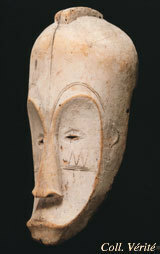 PARIS (AP) -- A celebrated 19th century mask by the West African Fang tribe fetched more than $7.5 million at auction in Paris, a record for a work of primitive art, organizers said Sunday. The mask, which is said to have inspired artist Pablo Picasso, brought in four times its estimated price of $1.9 million on Saturday, organizers of the sale at the Drouot auction house said. The buyer's identity was not disclosed. The mask was part of one of France's premier private collections of primitive art, which was on the block at Drouot this weekend. Started by Pierre Vérité and his son Claude in the 1920s, the collection features works mostly from France's former colonies in West and Central Africa. Though it was kept out of public view for most of the 20th century, the collection made a big impression on celebrated artists such as Picasso, Henri Matisse and surrealist Andre Breton, who saw it in the 1930s. More than 500 pieces were up for auction and were estimated to bring in between $19 million and $25 million -- though prices appeared to be rising far beyond those expectations. 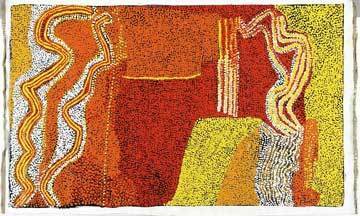 Of 96 pieces sold Saturday, eight passed the mark of $1.27 million, said auctioneer Muriel Berlinghi-Domingo. France will soon unveil the Musée du Quai Branly, a major new museum championed by President Jacques Chirac that will house the country's large and until now scattered collection of primitive art. PARIS, May 22, 2006—June is a very important month in Paris for tribal art. The central event is the long-awaited opening of the Musée de Quai Branly on June 24, following a series of private openings. The museum, which has been designed by Jean Nouvel and resembles a giant footbridge surrounded by a garden, will house arts of the indigenous peoples of Africa, Oceania, Asia and the Americas. 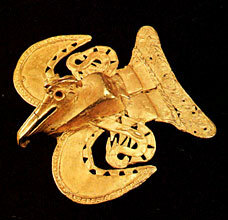 It is intended to further Paris' claim of being the center of the tribal art world, outshining Brussels and New York. 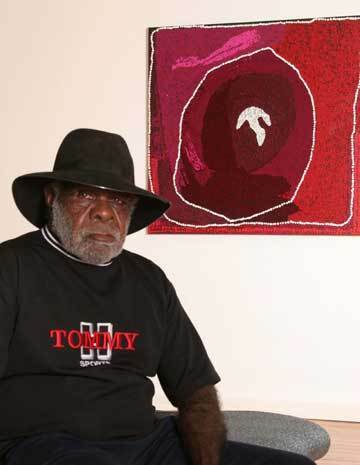 Surrounding this major event will be a series of auctions and gallery exhibitions. The major auction is the collection of Pierre and Claude Vérité being sold at L'Hotel Drouot on June 17 and 18. The two-day auction is organized by primitive-art experts Guy Loudmer, Alain de Monbrison and Pierre Amrouche. 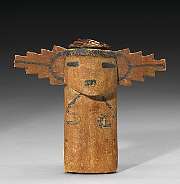 "Pierre Vérité bought at the very beginning of interest in tribal art," said Monbrison. 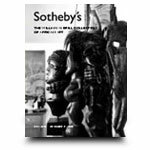 "At the time Pierre started buying, just after World War I, African art was sold by paintings dealers, such as Paul Guillaume. 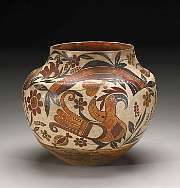 It was not until the 1930s that a few dealers began to specialize in tribal art. 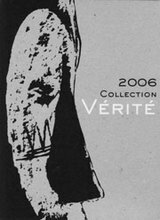 The Vérité collection is the only one from the early days that has survived more or less intact," he says. In the early 1930s, Pierre Vérité, who was an artist, lived in the artist colony known as "La Ruche" (the Hive) and opened his first gallery in primitive art. In 1937, he opened the Galerie Carrefour on the Boulevard Raspail, which was a hangout for artists and collectors such as Picasso, Helena Rubenstein, Nancy Cunard and Andre Breton. In the 1940s, Pierre's son Claude became increasingly involved in the gallery. 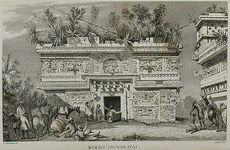 He went on African expeditions, collecting objects and information, and took photographs to document his travels. Later on, the gallery numbered important American collectors, such as artist John Graham and actors Edward G. Robinson, Vincent Price and Anthony Quinn among its clients. The collection stops around 1960. "Many of the pieces in the collection are unknown," said Amrouche, "and have never been exhibited. They are all very old and have great patina that has never been touched. Seeing them for the first time was like opening Ali Baba’s cave." The Vérité collection is comprised of 520 pieces and is expected to bring $15-20 million. 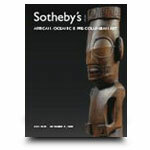 It is very broad in scope, encompassing virtually every African culture and also some Oceanic objects. Eclectic as it is, the collection is especially strong in material from Gabon and West African cultures, such as the Senufo, Baule and Bembe. 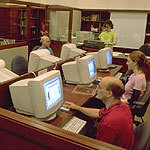 Many of the pieces are well known, having been featured in major publications. 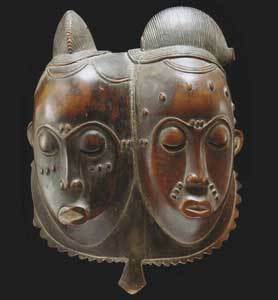 The star piece is a Fang Ngil mask from Gabon, considered by many to be the finest of its kind, which is expected to bring around $1.5 million. 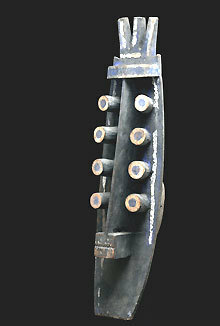 The rare, large mask, which is made of wood covered with a layer of kaolin, has been published and exhibited many times, including at the important "Primitivism and Twentieth-Century Art" show at the Museum of Modern Art in 1984. 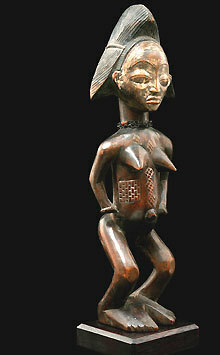 Another star is a rare Congo reliquary figure of a man with a child from Gabon (est: $300-350,000). The estimates for the pieces are "strong and realistic" says Amrouche, "reflecting the strength of the market." L'entière «Vérité»:Arts premiers. Deux jours d'exposition précèdent la prestigieuse vente de la collection à Drouot.